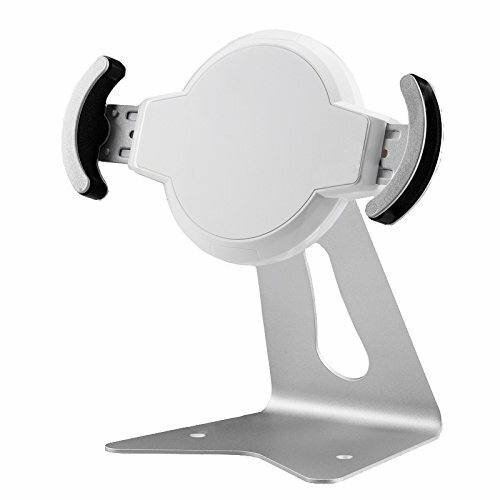 Arkscan AST10 Anti-Theft Security Lock Stand fits for universal tablet device, the stand is made of steel with aluminum alloy in Silver & White. AST10 is a heavy-duty steel stand holder that adjusts diagonally to fit on iPad and tablet size with a secure grip on the corners. The solid steel stand offers stability even when tablet is swiped or pressed. 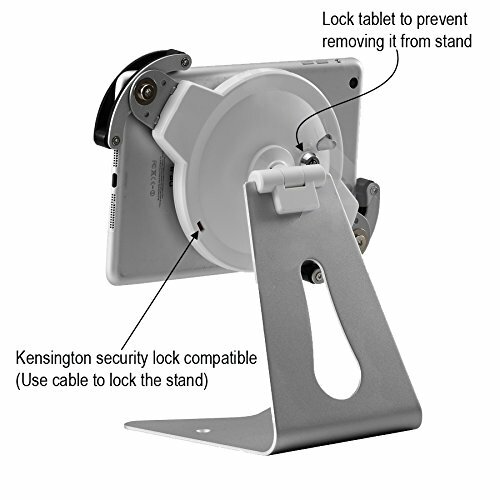 A solid metal stand offers stability and can be secured to a desk or countertop through predrilled holes for easy installation and extra securities with key to lock the tablet to the stand, or take it out easily by using a key to unlock it, plus the stand can be locked by a Kensington slot to enhance the anti-theft security. The perfect design to use any tablet as a workstation, retail display or POS system. The holder can tilt to easily adjust the viewing angle and rotate for horizontal or vertical views. 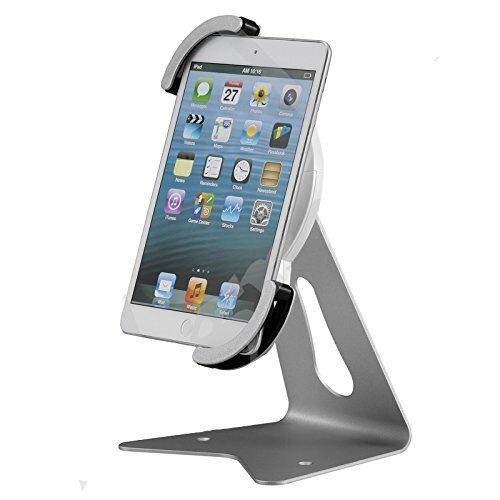 The stand is provides the 360 degree rotation for the best viewing angle. The stand fits all iPad (not or iPad Mini) and any other tablets in about screen size of 9” to 11”, the exactly size of the tablet that fitted is within the measurement from 240mm to 294mm, which it’s from 9.5 inches to 11.5 inches. Package includes: AST10 Anti-Theft Security Holder, a pair of key; Kensington cable is not included. Stable and solid stand holder with 360 degree; rotation allows any angle to display; allows you to tap and swipe on the screen firmly. Stable steel stand with predrilled holes for countertop installation; safety bracket latch to stabilize the device on the holder preventing device failing, easy to install and remove tablet. Strong security solution for office, retail, school, commercial or personal use ; an anti-theft Kensington compatible security slot allows to lock the stand, plus lock with the tablet device by a key. Suggest tablet size between 9" to 11", the exactly size of the tablet that fitted is within the measurement from 240mm to 294mm diagonally, which it's from 9.5 inches to 11.5 inches.